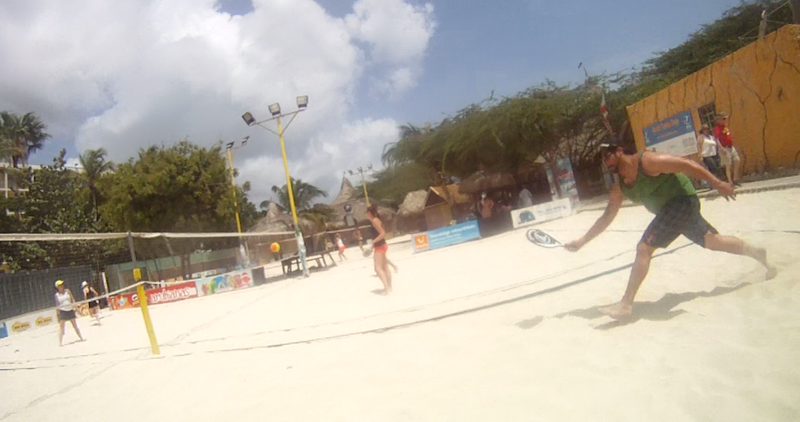 While in Aruba, I discovered a new sport that combines everything I love about sports. 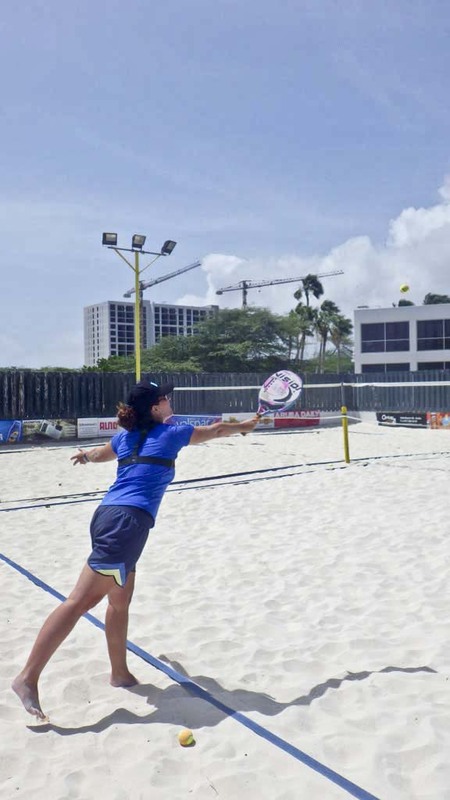 Take the fun and fast-paced sport of tennis, add a volleyball court, and a sunny beach setting, and you have the new, exciting sport called beach tennis. It’s like tennis except its played on a regulation beach volleyball court. Two to four players on each team volley back and forth without letting the ball bounce. One hit per team is all that is allowed and points are scored when the ball is hit outside the lines or touches the ground. 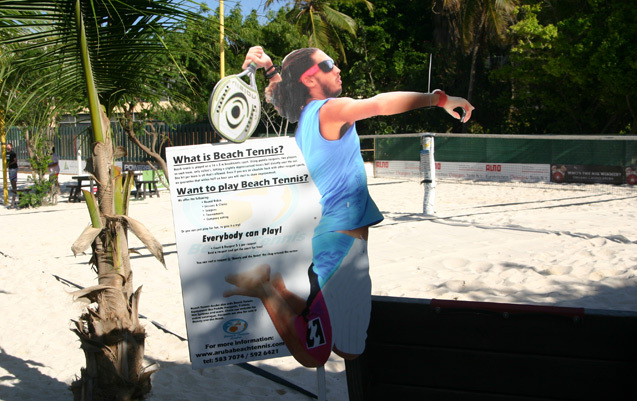 Beach tennis is played with specially designed paddles and de-pressurized tennis balls that make it easier to keep a rally going. After twenty minutes of instruction, I was ready to test my skills in a match and after two hours, I wanted to add “play beach tennis regularly” to my bucket list. I think I found my new favorite sport. 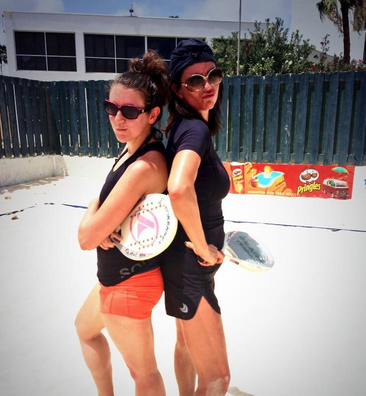 At MooMba beach, we took a two-hour beach tennis lesson from Bertrand Coulet. Starting out with basic instructions, we advanced to rallying the ball back and forth twenty times in succession before starting a two-on-two game. I was exhausted after the first ten minutes and broke a sweat before we even started rallying; it’s definitely a great workout. My partner, Chris, and I worked well together and we even won a few matches. But he was equally exhausted after each match and we needed several intermissions during the two-hours. While he was almost passed out on the bench, I thought it was the opportune time to take a few photos. Although the net is higher than regular tennis, I still managed to serve well a few times and I was proud of my first-time effort. We recently moved to a new community in North Carolina and our neighbors are very sports-oriented. I’m thinking an introduction to beach tennis is in order. Maybe I can convince someone to put a net in their backyard so we can all play regularly. That could be an item for next year’s list. This entry was posted in Aruba, Land Adventure, Travel and tagged Adrenaline, adventure, beach, bucket list, Bucket List Publications, bucketlist, Lesley Carter, sports, tennis, travel, volleyball by lesleycarter. Bookmark the permalink. Looks like a lot of fun. Glad you are having a great time :). This definitely looks like a great new sport. Seems to also be a mix of badminton. What a game- I hope you get Olympic status for it! I shared it with my family and friends. Thank you for the kind words and encouragement. Really nice. I will try to play if I have enough heart and legs to do it!! Blue skies, sand underfoot….I tell you what, if we had that here, I’d be dusting off my raquet! Looks great! Wow. Good for YOU. Was it HOT the day you played. I’m sure it could get intense, but we had a lot of fun with it. Is tennis your favorite sport? Will try this out with my family. Sports on the beach is always better than just sitting there baking! That sounds like a seriously tough but fun work out! Looks awesome! As a tennis player, I’ve been meaning to try this out, so I’m kind of jealous that you got to do this! I have never seen this sport before, but it looks like some amazing beach fun! 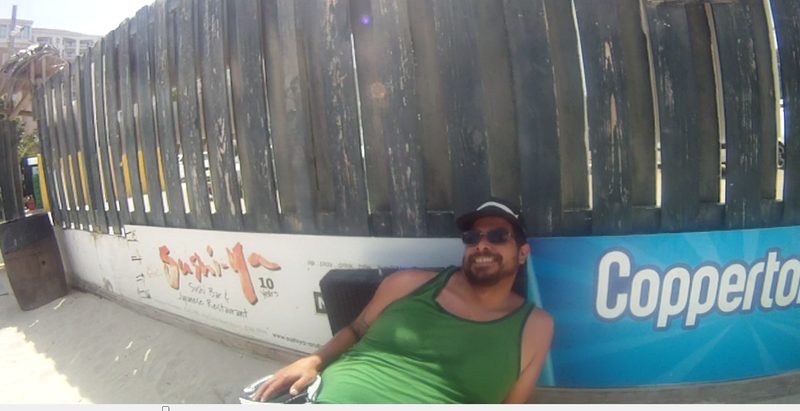 thanks for stopping by … well, that cardboard cutout guy looks cute!!! wow .. how hot was the sand ???!!! The sand wasn’t too bad because it’s so white, but I think it’s better to go early in the day. Have you been to Aruba? Played Badminton for years… this looks like a blast!